The Chief Executive of Sainsbury’s, Justin King CBE, has written to the Angling Trust admitting that jellied eels sold in his supermarkets are not in fact from the British Isles, as they were marketed, but are in fact from New Zealand. He was responding to a challenge by the Angling Trust, who had been informed by the National Anguilla Club that jellied eels were being sold in Sainsbury’s under a large sign saying “from sustainable sources from around the British Isles”. 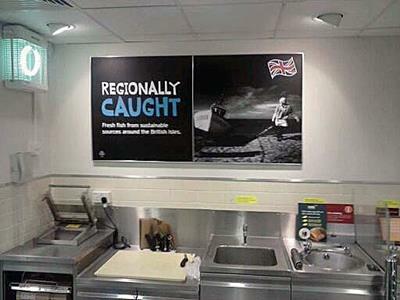 Mr King said that “as a result of your communication, we will ensure that communications at our store fish counters are as clear as possible.” The European Eel has been a recognised endangered species since 2010 and anglers are required by law to return any that they catch using rod and line. The Angling Trust has campaigned over the past three years at national and international level for a complete cessation of all commercial eel fishing following a 95% decline in stocks in recent decades and very little science about the natural history of this mysterious fish which used to form a vital part of freshwater ecosystems. The Trust believes that a precautionary approach must be adopted and calls on the Environment Agency to stop issuing commercial licences. Andrea O'Sullivan General Secretary, National Anguilla Club, welcomed the news saying: "I'm delighted that Sainsbury's have acknowledged that their advertising was misleading to their customers however, it is still disappointing that eel is sold at all as the New Zealand Long Fin and Short Fin eels being supplied are also under threat. It seems like the "sustainability" problem has just been shifted to the other side of the world rather than been addressed in a more ecologically responsible manner by withdrawing eel meat from sale completely. Selling eel meat, even when sourced from abroad, perpetuates the supply and demand cycle rather than changes the eating habits of consumers, and all the major supermarkets which sell eels from New Zealand, like Sainsburys, Tesco and Asda among others, are equally culpable in this respect. It would be hard for one major player in the chain to drop out of the market and leave its competitors free to carry on; however Sainsburys has an ideal opportunity to lead the field by example, if it truly believes in being a sustainable retailer, rather than follow the others for reasons of profitability only. Only time will tell if they have the courage of their convictions to do this." This entry was posted in News and tagged Angling Trust, Eels, WFD. Bookmark the permalink.